Soho House Toronto has set up a permanent home in a 10,000 square-foot space on Bishops Block inhabiting a building dating back to the 1800s. 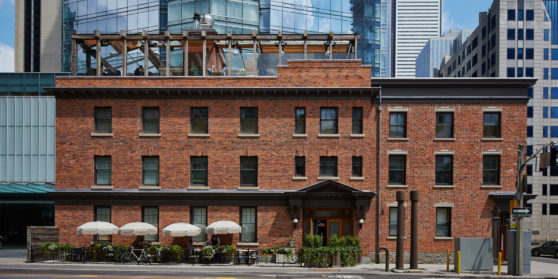 The building, which was originally one of Toronto’s first ever hotels, has been carefully restored brick by brick, to fit in with Soho House’s relaxed style. At ground level you’ll find the Club Floor, including the Club Bar and the more intimate Library – spaces where members can eat, drink, work, socialize and relax with comfortable seating, vintage furniture, a long bar and a large fireplace. On the second floor is the Club Restaurant, including a pantry bar fully stocked with fresh international and local cheeses and aged cured meats. The third floor is home to the Pretzel Bell Bar, named after the tavern which originally occupied the building.